The RRX train, a Siemens Mobility Desiro HC, which was unveiled to much fanfare at InnoTrans 2018 entered service on Line 11 between Dusseldorf and Kassel, Germany, on 9 December 2018. Now the project partners have taken stock and the feedback is positive. Manufacturer Siemens Mobility ensures that the 15 RRX trains currently in service remain operational at all times. Siemens takes care of maintenance and servicing at its Rail Service Center in Dortmund. 15 Rhine-Ruhr Express (RRX) trains have been running on Line 11 between Dusseldorf and Kassel in Germany since December 2018, when the new timetable came into effect. The operator for the service is Abellio Rail. Now that the RRX trains have been in operation for more than 100 days, the project partners have evaluated the new rolling stock. It’s good news: operations are stable and the passengers’ feedback is positive. The preparations for deploying the RRX train on Line RE5 as of June 2019 are also going according to plan. It is vital that all parties work well together to ensure successful operations on Line 11. Given that there are a large number of parties involved and many different aspects to focus on, this is a complex task. To simplify it, Abellio Rail NRW and National Express have moved closer together geographically. There is now a fixed position for RRX operators’ staff in the DB Netz office in Duisburg as well as in the Rail Service Center in Dortmund. This way, important planning decisions can be made together. National Express will begin operating the RRX train on Line RE5 between Wesel and Koblenz on 9 June 2019. It will deploy the train in its double formation with two electric multiple units. This will provide seating for 800 passengers. “The entry into service on Line RE5 (RRX) is an important contribution to improving the situation in the Rhine-Ruhr corridor, which is running close to capacity. The preparations at National Express are in full swing. The train drivers and guards are undergoing intensive training sessions. 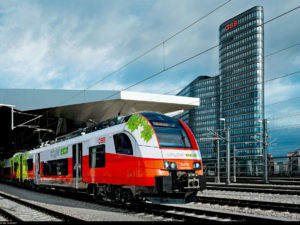 The agreement is that as of May 2019 the first RRX trains will take over trips on Line RE5 from the current operator DB Regio NRW. Even after the RRX train enters service on Line RE5, work on the RRX project will continue. In December 2019 National Express will deploy the train on Line RE6 from Cologne/Bonn Airport to Minden. And in 2020 then the new trains will enter service on Line RE1, between Aachen and Hamm, with Abellio Rail NRW as the operator. Finally, as of December 2020 National Express Rail will take over Line RE4 between Aachen and Dortmund. The ultimate goal of the RRX project is to have a train every 15 minutes on the Westphalia-Ruhr Area-Rhineland main axis. This, however, is dependent on DB altering and expanding the rail infrastructure.